Top & Best jquery plugins,tutorials,effects with jquery examples,demos for beginners,designers,developers.jQuery Plugin Tutorial with example. 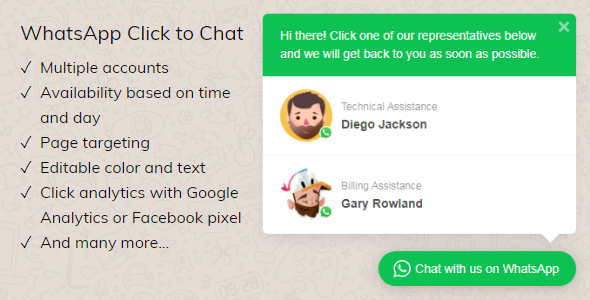 This is one of the best way to connect and interact with your customer, you can offer support directly as well as build trust and increase customer loyalty. 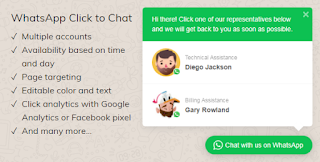 NinjaTeam WhatsApp Chat plugin provides you options to select colors for the WhatsApp box to fit your website style and taste. Moreover, you can customize each box for each person depending on their time availability with photo, name tag and job title. When you are online, the button is green or other color you set, otherwise, it is grey. Therefore, when you’re not responding quickly, customers don’t feel they are ignored. They know exactly your available time in which you set it at the first place.